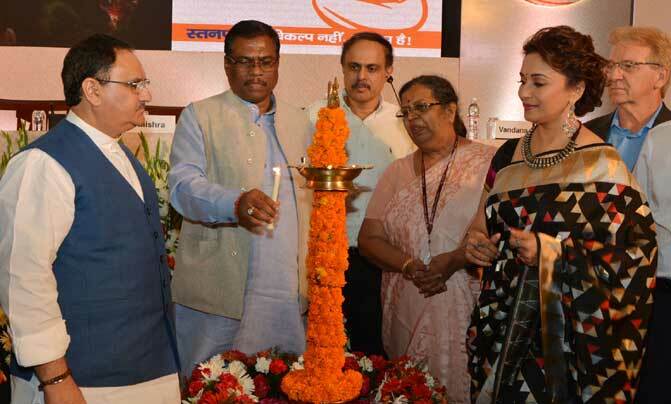 J P Nadda, Union Minister of Health and Family Welfare on 8th August launches MAA (Mothers Absolute Affection), a flagship programme to ensure adequate awareness is generated among masses, especially mothers, on the benefits of breastfeeding. Shri Faggan Singh Kulaste, Minister of State for Health and Family Welfare, Smt. Anupriya Patel, Minister of State for Health and Family Welfare, Shri C K Mishra, Secretary (Health) and Smt. Leena Nair, Secretary (WCD), Mr. Louis George Arsenault, UNICEF Representative to India and Ms. Madhuri Dixit, UNICEF Celebrity Advocate were also present at the occasion, along with other senior officials. MAA (Mothers Absolute Affection) is a nationwide programme launched in an attempt to bring undiluted focus on promotion of breastfeeding and provision of counselling services for supporting breastfeeding through health systems. Madhuri Dikshit, who is a mother of two sons, is the brand ambassador of this campaign, which is an intensified program for the promotion of breast-feeding along with UNICEF India.